The HP LD4245tm has been discontinued. No direct replacement is available. Get a digital signage display that"s built to last with the commercial-grade display components designed for 24/7 operation and backed by a limited three-year warranty. Broadcast your images, documents, and videos on a 41.92-inch diagonal Full HD1 IPS display. Enjoy a great view from almost anywhere in the room with 178-degree viewing angles. 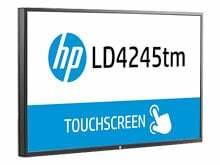 Deploy high-impact message on a high-performance, interactive 5-point touch Full HD1 digital signage display that"s redesigned with thin and light LED backlights and ready for 24/7 installations. Save time and money with the integrated player and networking software and a range of connectivity.